With a little practice, the simplest of cooking methods, oven-roasting, produces elegant results. To keep your roast moist and delicious, here are a few tips from the Butchers Market. 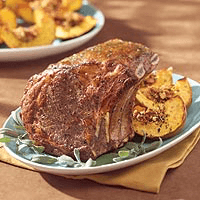 Bone-in/Standing Rib Roast 6-8 lbs. 325°F 2 to 2 1/2 hrs. 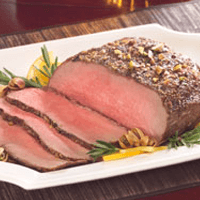 Steakhouse Roast/Strip Loin Roast 3-5 lbs. 325°F 45 mins. to 1 1/4 hrs. 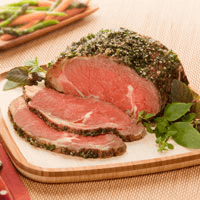 Boneless Prime Rib Roast 6-8 lbs. 325°F 2 1/4 to 3 hrs. Tie roasts into compact shape with butcher string and sear all sides in a small amount of hot oil in a heavy pan on stovetop. Insert meat thermometer into thickest part of roast, without touching fat or bone, and place fat-side up in a shallow roasting pan. Do not cover, and do not add water. Roast at high heat (425°F) for 15 minutes, then reduce to listed temperature for optimal juiciness. Remove 10°F shy of your doneness preference, and loosely tent with aluminum foil. 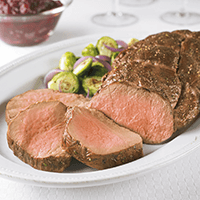 Let roast stand for 15 to 20 minutes until desired doneness is reached before carving. 2-4 8-12 lbs. 1-2 days 325°F 2 3/4 to 3 1/2 hrs. 5-7 12-16 lbs. 2-3 days 325°F 3 to 4 hrs. 8-10 16-20 lbs. 3-4 days 325°F 4 1/4 to 4 3/4 hrs. 11-13 20-24 lbs. 4-5 days 325°F 4 1/2 to 5 1/4 hrs. Tip: For faster thawing, leave turkey in original wrapping and place in cold water. Change the water every 30 minutes. Allow 30 minutes per pound. 2 to 3 1/4 hrs. Allow 1/2 pound of boneless pork or 1/3 pound of bone-in uncooked pork per person. Tip: Remove from heat at 150°F, and allow to sit for 10 minutes. The juices will redistribute throughout the roast before slicing.